MAY 11, 1950 ….. McMINNVILLE OREGON A classic set of impressive UFO photos was taken by Mr. and Mrs. Trent in the early part of the evening, just before sunset, on May 11, 1950, near McMinnville, Oregon. 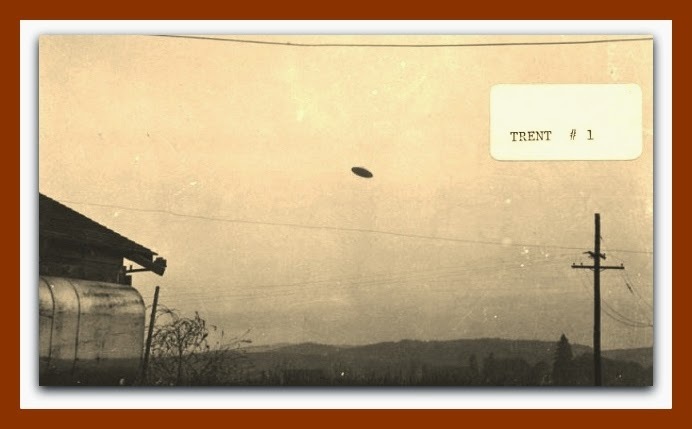 According to the Trent’s account the object, as it appeared over their farm was first seen by Ms. Trent while she was feeding the farm’s rabbits She then quickly called her husband who got the family’s camera and Mr. Trent then took two shots from positions only just a few feet apart. The pictures first appeared in a local newspaper and afterwards in Life magazine. Seventeen years later the photos were subjected to a detailed analysis for the University of Colorado UFO Project. William K. Hartmann, an astronomer from the University of Arizona, performed a meticulous photometric and photogrammetric investigation of the original negatives, and set up a scaling system to determine the approximate distance of the UFO. Hartmann used objects in the near foreground, such as a house, tree, metal water tank, and telephone pole, whose images could be compared with that of the UFO. There were also hills, trees, and buildings in the far distance whose contrast and details had been obscured by atmospheric haze. Hartmann then noted that his photometric measurements indicated that the UFO was intrinsically brighter than the metallic tank and the white painted surface of the house, consistent with the Trent’s description that it was a shiny object. Further, the shadowed surface of the UFO was much brighter than the shadowed region of the water tank, which was best explained by a distant object being illuminated by scattered light from the environment. “it appears significant that the simplest most direct interpretation of the photographs confirms precisely what the witnesses said they saw” Hartmann further wrote that “to the extent that the photometric analysis is reliable, (and the measurements appear to be consistent), the photographs indicate an object with a bright shiny surface at considerable distance and on the order of tens of meters in diameter.